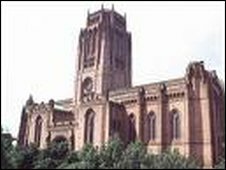 The bells of Liverpool's Anglican Cathedral are to ring out to John Lennon's anti-religious anthem Imagine. The bells will play the 1971 song, which begins "Imagine there's no Heaven", as part of an arts festival on 16 May at 1200, 1230 and 1300 BST. A cathedral spokesman said: "Allowing Imagine to be pealed on our bells does not mean we agree with the song lyric." The song has drawn criticism from some religious figures as Lennon himself has called the anthem "anti-religious". Liverpool Cathedral said it had carefully considered the "sensitivities" surrounding the song's lyrical content. "But we recognise its power to make us think. As a cathedral we do not shrink from debate. We recognise the existence of other world views," added the cathedral spokesman. The original idea to ring out Imagine came from artist Cleo Evans, who was commissioned by Futuresonic, a cultural festival, to develop the concept with the Anglican Cathedral. She said: "Imagine is an incredibly gentle, philosophical and moving song which speaks strongly of the need for peace. "It is an iconic song which will be performed in a thought-provoking and surprising setting." Lennon's widow, Yoko Ono said the idea was "so beautiful, it made me choke up". Ringer Sam Austin, 23, a student at Manchester's Royal Northern College of Music will lead the recital. He and seven volunteer bell ringers started rehearsals by playing the melody on hand-bells before progressing to the "world famous" Anglican bells, which are the highest and heaviest ringing peal bells in the world. The 13 bells are arranged around 'Great George', a central ringing bell which weighs over 14 tonnes and can be heard for miles around. A spokesman for Liverpool Catholic Diocese said it had no comment on the project.